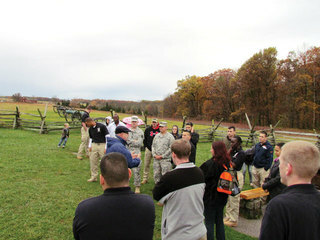 Some Belvoir Soldiers and civilians had a unique opportunity to develop their leadership skills while learning the country’s history. During a staff ride to Gettysburg National Military Park in Pennsylvania, the group toured parts of the battlefield; viewed monuments in honor of each state’s sacrifice and loss of life; were startled by simulated gunfire in a short, Morgan Freeman-narrated movie, “A New Birth of Freedom;” and learned about the significance, strategies and lessons of different aspects of the three-day battle there. According to Capt. Daniel J. Tucker, Belvoir’s Headquarters Battalion Executive Officer and Headquarters and Headquarters Company Commander, one of the trip’s coordinators, staff rides represent a unique and persuasive method of conveying a lesson of the past to present-day Army leadership. “Properly conducted, these exercises bring to life, on the very terrain where historic encounters took place, examples, applicable today as in the past, of leadership tactics and strategy, communications, use of terrain, and, above all, the psychology of men in battle,” Tucker said. “This historical study, particularly with personal reconnaissance, offers valuable opportunities to develop professional leadership and the capacity for effective use of combined arms on the air-land battlefield,” he added. Soldiers who went on the staff ride echoed Tucker’s thoughts about the day in Gettysburg. For Spec. Jared Ecklund, a patrolman with the 212th Military Police Detachment for almost a year, the trip to Gettysburg was definitely an experience, as it also was his first staff ride. Cruz, originally from Denver and a Belvoir Soldier since May, brought his wife and two children to Gettysburg. According to the National Park Service, the restored Gettysburg Cyclorama depicts Pickett’s Charge - the final fury of Gettysburg, often referred to as the Civil War’s turning point. The artwork is 377 feet long, 42 feet high and weighs 12.5 tons. It is housed in a climate-controlled building built especially to house it.